Send that information through with your name, full address and contact phone numbers. Happy clients that are more than happy to act as a verbal reference for the process and how it works. NO NEED TO EMPTY TANK WATER ! If you have a conrete water tank there are some basic things that shold be done to prolong the service life of these great water storage solutions. Many of the tanks we end up repairing have been let go for many years without the owners considering what is happening to there tank. 1. The overflow pipe on the tank must be piped away from the tank so the water overflowing doesn't sit around the base of the tank. 6 meters away. If the base starts to get undermined due to excess water erosion the tank base can then crack as well. 2. 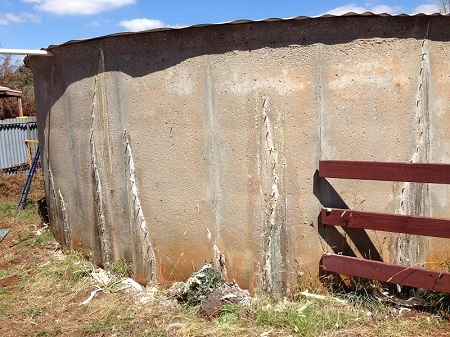 A water tank where water sits around the base in winter conditions is a recipe for disaster down the track. The base of the tank will subside to the wet side over many years and cracks will then start to appear in your tank when the base moves. Keep the base of your tank dry at all times with the relevant drainage. Spoon drains, etc. 3. Don't plant tree's / shrubs / plants, around the tank, roots will penetrate concrete over time looking for water especially in dry months. We have seen many tanks where the floors have cracked due to tree's roots pushing from underneath. Nothing planted around the tank for 6 meters. 4. The majority of the tanks we repair the cracks will show up on the overflow side of the tank, ( that half of the tank ), this is usually where the base has been wet for many years and movement to that side occurrs. 5. 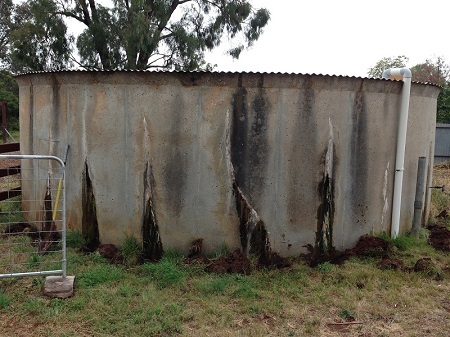 Consider how long water tank cracks have been leaking - some cracks can sit in a paddock and leak for 20 + years, this will then effect the steel reinforcement inside the tank wall and floors weakening the structural strength of the tank. Installtion of steel tank bands is a must in this situation. 6. 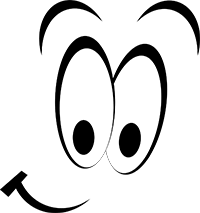 The earlier you can repair concrete water tank leaks the stronger your tank will be for future years. NOTE :- If you maintain your tank and repair the leaks now you will get 20 - 30 + years more out of a concrete water tank. Not a bad return on an old water tank that may have already been there for 30 + years, well worth the time and effort. Repair Your Concrete Water Tank Leaks and save for the future ! THE EARLIER YOU REPAIR TANK LEAKS - the more structural integrity your tank will have, you prevent further rusting of the concrete steel reinforcement, saving your tanks Structural Strength ! 50,000 Litres = 50 Tonnes of Water Weight on tank walls. Crack injection is commonly used in residential and commercial applications primarily because it is far less expensive than emptying tank water, cleaning out the interior of the tank, then drying the inside surfaces out as well as grinding all surfaces smooth. There is also no need to remove tiles and other finishes from the surface in order to fix leaks. Crack injection is the most reliable leaking crack repair system. CONTACT US FOR A QUOTE NOW - NO NEED TO EMPTY TANK WATER !! 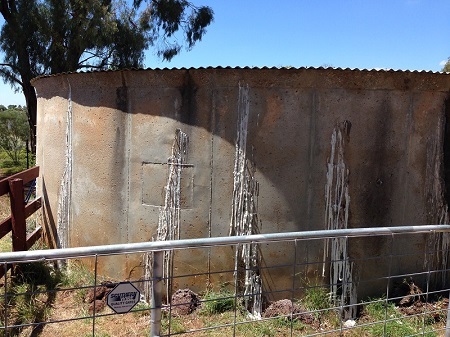 Concrete Water Tank Leaking before repairs were carried out January 2017 - Exford, Victoria. Concrete Water Tank Leaks - having been pressure injected to repair leaks - Polyurethane foaming underway which seals up leaking cracks from the outside of the tank without having to EMPTY tank water. Food Grade Potable Water Rated. 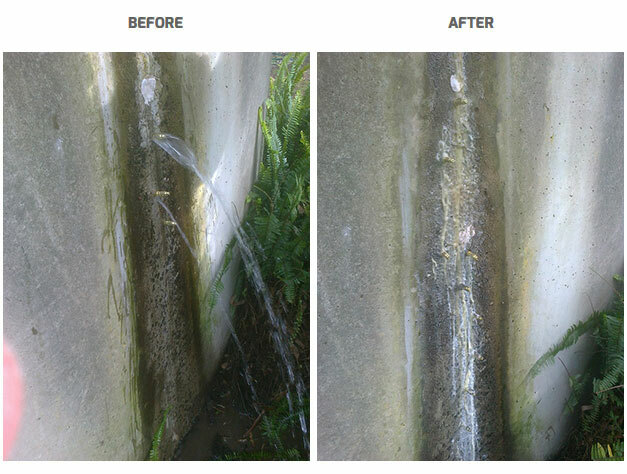 Concrete Water Tank Leaks Repaired - No Water Loss, Flexible, Strong, Durable, External Pressure Injection Sealant. Gippsland Water - Warragul & Traralgon Waste Water Treatment Plant - The pressure injection process is the same process used on Melbourne’s Burnley Tunnel, Desal Plant, Tunnels, Bridges, Drains, Reservoirs in the commercial building industry. Very effective and economical process for repairing concrete water leaks. We specialise in Commercial, Domestic, Rural repairs. Extremely high flowing concrete tank leak, repaired 14-07-2016. 6. Val Brennan ( Farmer ) Greta West ( Glenrowan area ), Victoria = 0417 135 485 - 2013. We use a pressure injection leak sealant that has been developed over many years, ( 25 + years ), in the Commercial Construction Industry. Proven and Tested in some of the harshest conditions. Strong, Flexible, Durable. Designed to repair leaking cracks without EMPTYING your water. The Buxton, Victoria, - Town Water Supply Tank, Victoria - leaks repaired were in a tank 4.5 meters high x 14 meters diameter with five very large leak flows almost the size of your wrist in diameter right at the base of the tank as well where pressure is at it's highest, these leaks were repaired exactly the same way as we do all rural and domestic concrete tanks with the crack injection system. 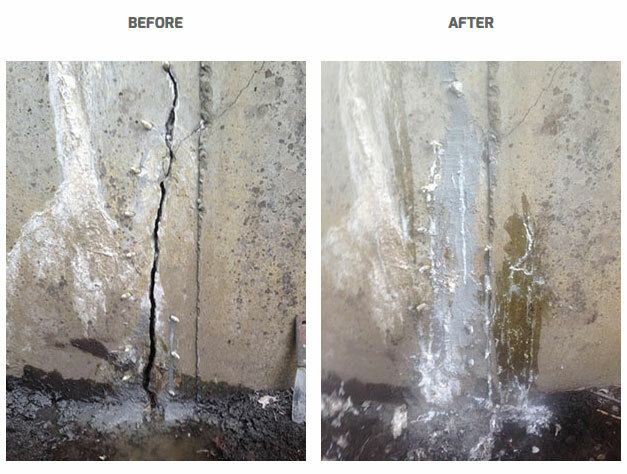 Crack Injection is the most effective leaking crack repair method in concrete repair industry. The widespread use of the method of crack injection is a tribute to the inherent versatility of low viscosity sealant injection for leak sealing applications. Crack Injection is a fluid sealant which is injected into concrete cracks, rock fissures, expansion joints and other voids in concrete structures. When used in concrete crack injection applications the sealant is injected into a crack; within minutes the sealant expands transforming from a liquid to a flexible rubber solid. Flexible, Very Strong and Durable being the key, Potable Food Grade Sealant for drinking water, with a extremely high adhesion rating. The sealant will expand and contract with future concrete movement. Concrete is subject to weather conditions and will expand and conctract along with these conditions, very similar to house foundations and brickwork. It has a very short cure time, making it ideal for active leak sealing. Extremely low viscosity allowing for even the finest fishers (cracks with a width less than 0.2mm) to be sealed. It will find cracks that you can't physically see ! The sealant cures normally whether a foundation crack is wet, actively leaking, or damp. Sealant, once cured, is flexible, allowing for movement in the structure. Any leak in a concrete structure can be sealed as long as we can get to it. SAVE Money, Water and Your Time !! 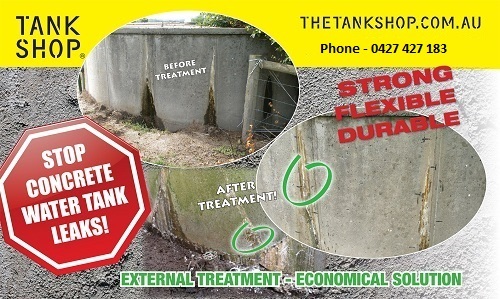 Click here to see Before and After examples of our concrete tank repairs. If your concrete water tank is a poured on site tank ( built on site ) with a tank wall thickness of 70mm or more, we will repair your tank wall leaks without EMPTYING the water from your tank ! Great Savings ! SAVE Money, Water and Time ! Economincal, Strong, Durable, Repair System. Proven Performance, the same system as used on Melbourne's Burnely Tunnel and Many other Commercial Building Projects. REPAIR AND SAVE ON A NEW TANK $$$ - To replace with new add up the additional costs, plumbing of downpipes and pump, new rock base for tank, excavation, machinery hire to demolish existing. REPAIR AND SAVE $$$ These costs can be in the range of an additional = $7,000 to $10,000 extra. 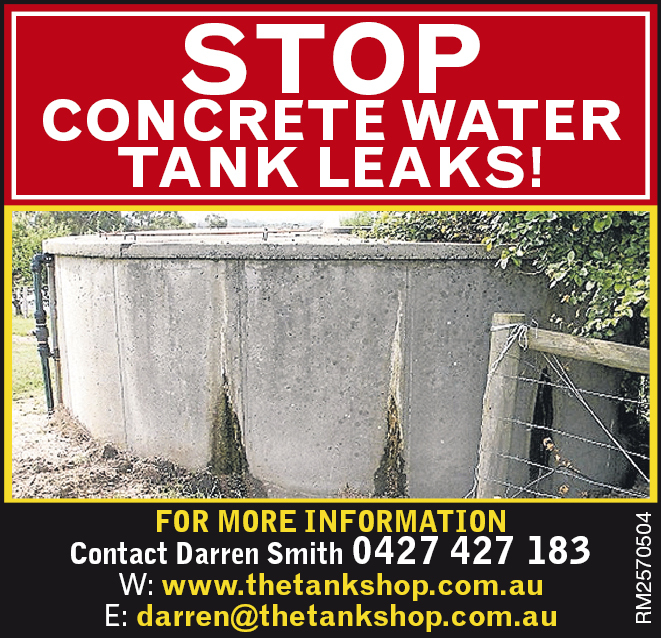 Click here to read more about concrete tank leak repairs. Very Happy Clients ! Tank Leaks Repaired without Emptying Water ! 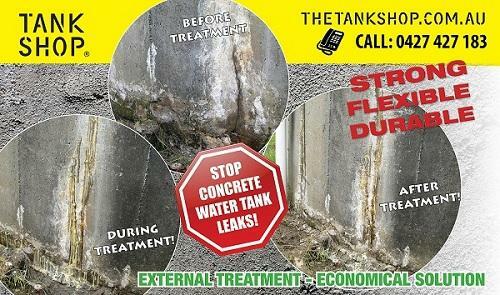 REPAIR LEAKING CONCRETE WATER TANKS - Yes we can repair leaks without you having to Empty Tank Water ! Leaking Tanks = Rusting Steel Reinforcement = Tank Walls Weakening !